A complete step-by-step tutorial on how to add your Blog posts to Facebook. How do you make your specified blog posts show up on your Facebook Business or Fan pages automatically? It is not too difficult but it will take some patience and these step-by-step instructions. If you don’t have a Facebook Business or Fan page, Create One Here First before you continue. NOTE/TIP: Open in another tab or window so you can follow along with these instructions. 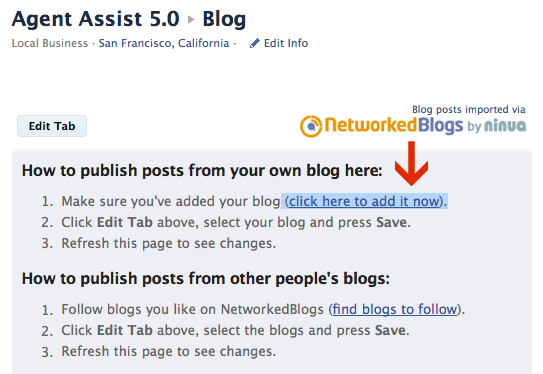 Step 3: Click on the “Add To Page” button of the Facebook Page where you want your Blog posts to appear. 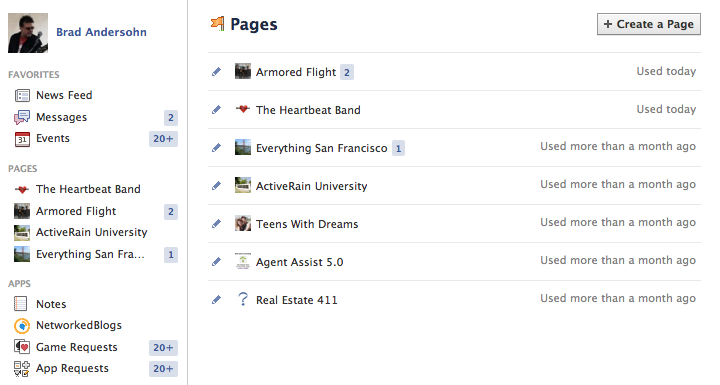 Once added, you can close window and go back over to Facebook to begin the next steps. Step 4: Go to Facebook.com. Click on the “Home” button in the top upper right corner. 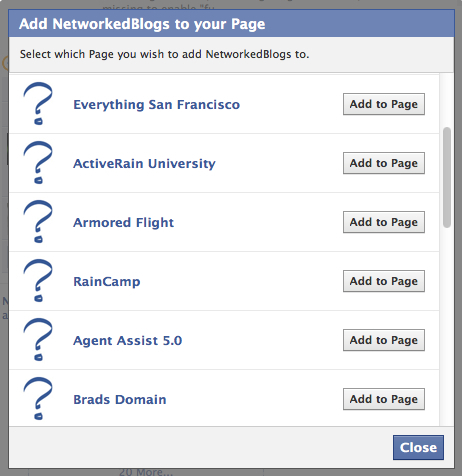 Now select the Facebook Business or fan page that you just added the NetworkedBlog application to. IE: Agent Assist 5.0 is the one I chose for this example. 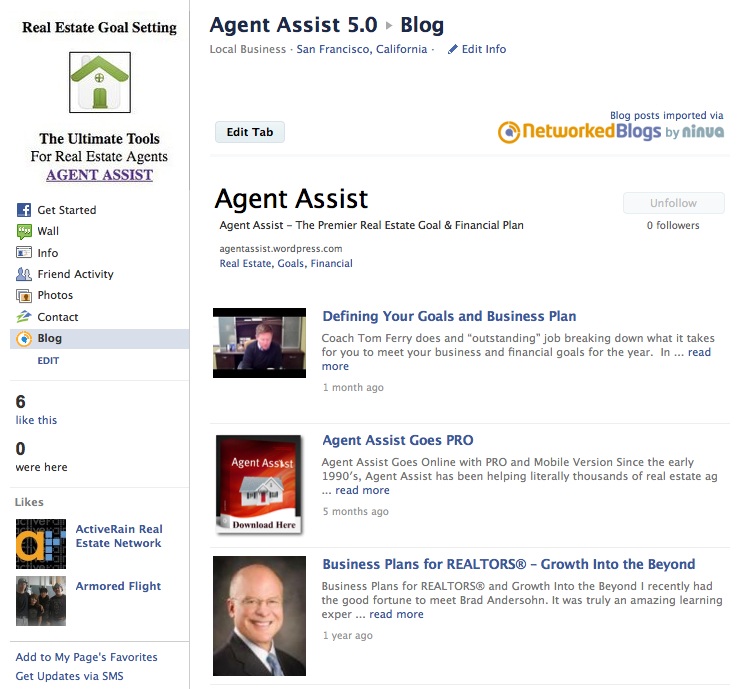 Step 5: Click on the Networked “Blog” icon/link located on the left hand sidebar of your Facebook page photo/image. Step 6: Select the link option to (Click here to add it now) in the instructions. Step 7: Take a deep breath, you’re doing great and almost finished. Step 8: Enter the information and complete the form on the following screen as it relates to your Blog, then click the “Next” button once again to continue. Step 9: Confirm you are the author by selecting and clicking the “YES” button. 2. Install a widget on your blog which can be removed once you’re confirmed as the author. 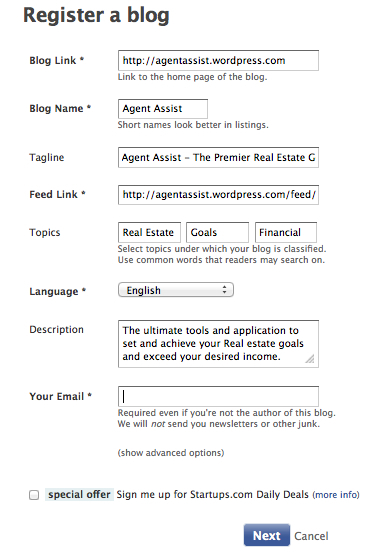 Option 2: The preferred method, copy the appropriate code to your blog as a widget. This method is quicker, easy to do, and you don’t have to bother your Facebook friends in the process. When done, come back and click on the “Verify Now” button. Step 11: Return to the Facebook Networked Blog setup page and click on the “Edit Tab” button to complete the final steps. 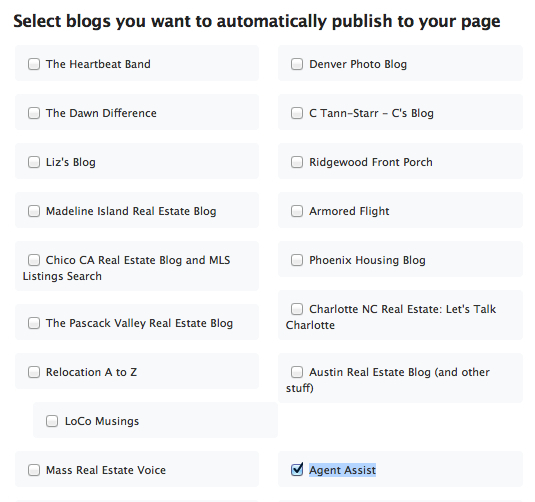 Your selected Blog articles will now automatically appear on your Facebook Business or Fan pages. 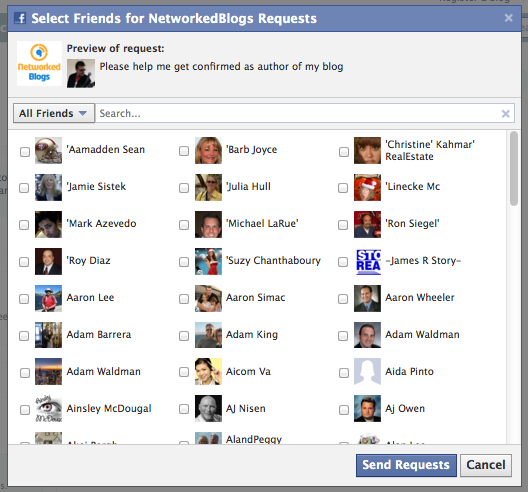 To confirm this, go to your Facebook page and click on the Networked icon/link on the left hand sidebar. Your Blog posts will be inserted onto the Facebook page directly from your selected Blog(s). To see the actual results of this process, CLICK HERE to view the example I used for the above tutorial. 1. You can move the location of your icon/link on the Facebook sidebar by clicking on “edit” link and just dragging and dropping the Networked Blogs icon wherever you want it to appear on your Facebook page sidebar. 2. You can make additional edits and changes by visiting your Blogs on the Networked Blogs site. An email will be sent to you by Networked Blogs once you’ve completed the steps and process above. There will be a link directly to your blogs. DISCLAIMER: Facebook is constantly and consistently making changes to their site all the time. If you find this post 5 or 10 years from now, there is the possibility that this option and process may have changed or even no longer work. I am not a DYI with social media (give me a house to stage or a wall to paint – I’m good) How do i find someone to HELP? Hi Barbara – I have a few walls you could paint! lol~ Let me know how I can help you? You can reach me via the contact tab at the top of the page if you need some support in the tech or social media arena’s. Thanks. Great tutorial Brad! And good timing, I’m currently working on my FB business page. Thanks for sharing. Hi Brad…..I can’t seem to get this working….probably doing something wrong..I’m sure! Can ya help me out! Brad, you never cease to amaze me! I’m going to do this with our company site. Thanks for all the know-how you’ve given me over the years (since Activerain) and even now on Pinterest. INTERESTING!!! Great detailed step-by-step walkthrough. Yeah, currently, I don’t have it synced up to publish like this. I’m actually manually sharing it, but there is definitely value in setting up a process like this! Keep up the amazing works guys I’ve added you guys to blogroll.